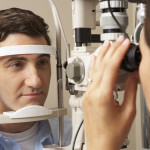 What are the different types of vision problems? There are three common types of vision problems: nearsightedness, farsightedness, and astigmatism. Nearsightedness is also called myopia. People who are nearsighted can see fine up close, but things that are far away are blurry. One out of every four people in the U.S. is nearsighted. Nearsightedness may get worse when you’re a teenager. People whose parents are nearsighted may be more likely to be nearsighted themselves. Farsightedness is also called hyperopia. People who are farsighted can see distant objects clearly, but things up close are blurry. But some people with severe farsightedness have trouble seeing things up close and far away. About one in every ten to twenty people is farsighted. You may become farsighted if your parents are farsighted. People with astigmatism may see blurry or stretched out images. You may have mild astigmatism and not know it because it doesn’t cause a noticeable change to your vision. How do I fix my vision problem? If you think you have a vision problem, see an eye specialist for a full eye exam. He/she will test your vision during the exam and decide what type of vision problem you have. Your eye specialist will write you a prescription for corrective lenses, if you need them. Then it’s time for you and your eye specialist to decide what type of corrective lenses is best for you: glasses or contacts. Should I get glasses or contact lenses? Deciding between glasses and contact lenses can be a difficult choice. Talk to your eye specialist and your parent(s)/guardian(s) about the pros and cons of each before making a decision. Watery eyes make too many tears, which is why this condition is also called excessive tearing. Is there anything I can do to make my watery eyes feel better? Yes. You can try applying warm compresses to your eyes and/or use saline eye drops to keep your eyes moist. If the problem doesn’t go away, see your primary health care provider (PCP). If you have any pain or changes in vision, call right away. A person with conjunctivitis usually has one or two eyes that look very red; this condition is often called, “pink eye.” Conjunctivitis is the swelling of the white part of the eye and the inside of the eyelid. Conjunctivitis may be caused by infection, allergy, or irritation. Infections are very contagious and may be spread at school when teens are in close contact. Not taking care of contact lenses may also cause infection. Contact your primary care provider if you have any symptoms of conjunctivitis. Treatment of conjunctivitis depends on the cause. Antibiotic ointments or eye drops may be prescribed if bacteria may be causing the conjunctivitis. Virus – There is no treatment, though cold compresses on the eyes will make you feel more comfortable. The infection should clear up in one to two weeks. Allergies – Antihistamines may keep the allergies under control. Cold compresses on the eyes usually help. Keep your contacts clean and take them out at night. Use clean towels to wipe your face. For many people, it’s hard to imagine the world without color, but for people with colorblindness, or a color vision defect, living without color is a way of life. There are three types of colorblindness – not being able to see red and green, not seeing blue and yellow, and seeing no color at all. Most people inherit colorblindness from their parents and since there is no treatment, they learn to live with the condition. Approximately 1 in 12 men (8%) and 1 in 200 women in the world are colorblind. Although some medications can cause colorblindness, most people are born with the condition. A sty is a red bump on your eyelid that is often painful. The bump can be on the inside or outside of the upper or lower lid near the eyelashes. A sty is a common eye condition and is caused when an oil gland on the lid gets clogged with bacteria, oil, or dead skin cells. When one or both eyelids (where the eyelashes grow) become inflamed, the condition is commonly due to blepharitis. This can happen if the tiny oil glands near the bottom of the eyelashes become blocked. Symptoms often include itchy eyelids, red and watery eyes, flaking of the skin around the eyes/lids, sensitivity to light, and crusty lids in the morning. See an eye specialist if symptoms don’t get better.